Sir Thomas More (1478-1535) - Thomas More was to Henry VIII as Thomas à Beckett was to Henry II three and a half centuries earlier (see Thomas Beckett). That is, both men were in the service of the king, but turned against him over clashes with the church. And it cost both of them their lives. Although not a member of the clergy, More was a devout Catholic and had considered a career as a monk. As it turned out, he became a lawyer like his father. In 1504 he was elected to Parliament introducing him to the world of politics. Along the way, he became friends with Thomas Wolsey, Archbishop of York. Wolsey was appointed King Henry's Lord Chancellor in 1515, which would be a boost to More's career. In 1523, on Wolsey's recommendation, More was elected Speaker of the House of Commons. A couple years later, he brought More directly into his employ by making him liaison between the Lord Chancellor and the king. When King Henry tried to leave Catherine of Aragon, Cardinal Wolsey failed to secure an annulment from the Pope. This led to Henry's eventual break from the Catholic Church and a falling out between Wolsey and the king. He was stripped of his chancellorship and indicted for treason; although he died of natural causes before Henry could decapitate him. 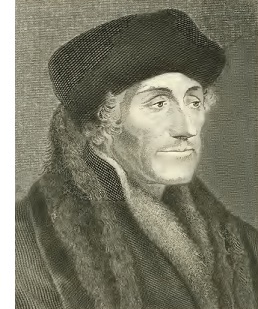 Thomas More was appointed to replace Wolsey. He served as Henry's Lord Chancellor from 1529 to 1532. At this time the Reformation was underway, and More saw the movement as heresy against the church. He did everything possible to prevent its spread throughout England. On the king's matter, More initially supported him, even denouncing the actions of his friend and predecessor, Wolsey. But as Henry's rift with the Pope grew, More's support for his boss waned. It began in 1530 when More refused to sign a letter asking Pope Clement VII to annul Henry's marriage to Catherine. The king responded by removing many of More's allies from office. Fearing reprisal, More resigned as chancellor in 1532. But that did not end his troubles. He did not attend the coronation of Henry's new wife, Anne Boleyn in 1533. This was seen as a snub of the new queen. And in 1534, he refused to take the "Oath of Supremacy" acknowledging the king's rule over the church. Henry arrested More for treason. He was tried and found guilty. The jury sentenced him to be hanged, drawn and quartered, the typical death sentence for members of non-nobility. But Henry in his great mercy commuted his sentence to cutting his head off instead. He was executed on July 6, 1535. Four hundred years later, in 1935, Sir Thomas Moore became Saint Thomas More when he was canonized by Pope Pius XI. Besides his conflict with Henry VIII, More is also known for his book, Utopia, published in 1516.